In order to manufacture high precision gear wheels for example, it is very important that the eccentricity between pitch circle and seating bore is very small. For this purpose the diaphragm clamping system SM is used. For machining the seating bore it allows clamping of the gear wheel at the pitch circle. The clamping element is a ring disk with primarily three clamping jaws. 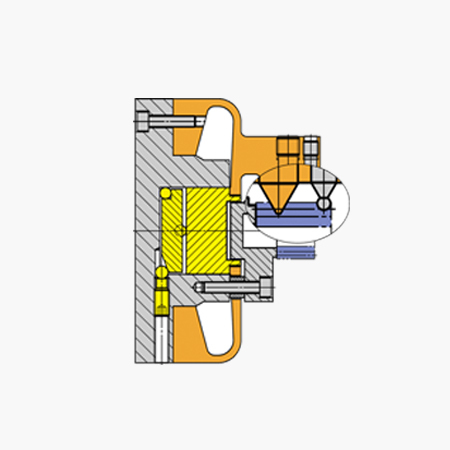 If the workpiece is thin-walled the diaphragm can also have four or six clamping jaws. These are either carved out of the diaphragm or they are screwed onto it. By applying an axial force onto the diaphragm, it bends in direction of the force. The clamping jaws simultaneously move axially and open in radial direction. The gear wheel is being released. Due to its flexibility the diaphragm returns to its initial position if the axial force is reduced or taken away. The gear wheel is being clamped in axial and radial direction.